To be fair, if fair is the correct word to use, the genesis of Ms. Carlson's article may not have come from an original inspiration; it may have been initiated via a solicitation from an interested subjective party. These kinds of solicitations usually come to freelance writers and speakers with suggested phrases and key points that must be addressed in the presentation. Because these solicitations often emanate from what seem like respectable middlemen and public relations companies, the freelancer often does little or no independent fact checking, choosing to just rely on the veracity of the information provided. Given the large number of inaccurate statements in Ms. Carlson's article, it probably wasn't her investigative skills that were at fault. My problem with Ms. Carlson's article begins with the title. There are two reasons for this: First, it's untrue, ethanol is an excellent fuel. Second, she included nothing within her story to support calling ethanol a bad fuel. Top automotive people have always considered alcohol to be the best fuel. This was true of Henry Ford as well as Charles F. Kettering, Thomas A. Midgley and T.A. Boyd (GM's top scientists in the early 20th century). And it's true today with the continued use of ethanol or methanol in the most advanced race cars and high performance street cars. Incidentally, Kettering, Midgley and Boyd were responsible for inventing leaded gasoline, which became the dominant engine fuel. The invention happened because GM was searching for a formula that would imitate ethanol's anti-knock characteristics. It became the favorite fuel of GM once the bean counters at GM realized that they could patent the invention and make billions from it. GM was the world's largest auto maker even then, and when combined with patents owned by Standard Oil and DuPont, they had a virtual monopoly around the world on a liquid fuel that could be used in high-compression engines (competition from ethanol was virtually non-existent because of Prohibition). Gasoline became the primary engine fuel because of greed, not because of its inherent quality as a fuel. The world's biggest car maker, oil producer and chemical company virtually bought the position by buying political power. Continuing from the story headline the information presented by Ms. Carlson doesn't get any more honest as she thoughtlessly rattles off hackneyed, long disproved criticisms of ethanol like a detached high school cheerleader who doesn't understand the rudiments of the game she's cheering for. Ms. Carlson writes that while ethanol was supposed to help reduce our dependence on foreign oil; combat climate change; be a gateway for more renewable fuels technology; and reduce gasoline prices because it was cheaper; that it hasn't done any of these things. She is wrong, it has done all of these things. If just one gallon of gasoline was displaced by one gallon of ethanol then it has lessened America's dependence on foreign oil. This is simple mathematics. If America used 13 billion gallons of ethanol in 2014 to help power our passenger vehicles then that means we reduced our dependence on foreign controlled oil by 13 billion gallons - simple mathematics. Regarding "climate change," if one is to argue that man-made climate change is real and that vehicle emissions play a large part in creating the problem, then the use of ethanol in place of gasoline does combat man-made climate change. Ethanol is a "cleaner" burning fuel; it produces fewer harmful emissions than gasoline. Paid-critics of ethanol will often use oblique elements of the total ethanol production process to arrive at the net conclusion that ethanol is a "dirtier" fuel than gasoline. However, if the same methodology of including secondary considerations related to gasoline production was used to reveal the true extent of gasoline's negative impact on the environment it would show a horrifying comparison between ethanol and gasoline. Least among the secondary considerations of gasoline production is all the fuel required to militarily defend and protect the oil industry - this includes the production of the vast amount of military materiel needed and expended, not to mention the thousands of lives lost every year. By the way, to date, not one American serviceman has been killed while defending domestic ethanol production. Ethanol's value as a "gateway" to more renewable fuels is incalculable. Its mere presence demonstrates that a substance other than gasoline or diesel can be used to power an engine. Regardless of how negative a critic can try to paint ethanol, we see that there is a solution to the myriad problems and concerns related to petroleum oil; including issues of long-term, uninterrupted availability. On a tangible level, acceptance of crop-based ethanol has led to breakthroughs and advancements in the development of cellulosic ethanol, as well as methanol and methane fuels. Studies released in 2009 and 2012 by Professors Xiaodong Du and Dermot J. Hayes showed that ethanol use did reduce gasoline prices. Despite claims of rebuttal by Professors Christopher Knittel and Aaron Smith, Mr. Hayes successfully defended the findings of his and Du's work. Mr. Knittel subsequently acknowledged "That ethanol most likely reduced gasoline prices," although he stated that the reduction was less than claimed by Hayes and Du. However, a reduction is a reduction, and in a world where a three-cent reduction in the price of gasoline is considered national news, I can't see how Debbie Carlson is able to categorically deny that ethanol has not reduced the overall price of gasoline. In addition, all the studies, claims and counter-claims by Professors Du, Hayes, Knittel, and Smith were concluded before Carlson wrote her story. This means that if Carlson was out to publish an objective story about ethanol that this information was available to her. Instead, it’s clear that her story was not meant to be objective, it was meant to be a bash-ethanol-at-all-costs story so that she could received some type of financial reward from the oil industry. Moreover, let's say that ethanol provides no reduction in the cost of filling your fuel tank. Let's say that the entire reason for replacing gasoline with ethanol is just a wash, on the effective price per gallon. So the only benefit is that America gets to retain the one billion dollars that leaves America every day to pay for foreign oil. These dollars may never make their way back to America. If we can avoid sending the $1 billion a day ($360 billion per year) out of the country, and instead use those dollars here to pay salaries and buy domestically produced goods, those dollars become stimulus for the economy without having to print additional dollars and devalue those already in circulation. Then, if those dollars are spent on American workers and American products, we actually wind up recycling the dollars and multiplying its stimulus effect several fold. It could be possible to recycle the $360 billion 3, 4, 5, 6 times, giving us a trillion dollar-plus stimulus every year for every year that we do without gasoline. If the $800 billion stimulus package in 2008-9 was significant in helping our economy, imagine what that this stimulus could do for America. Ms. Carlson goes on to decry the amount of corn being used for ethanol. She attempts to re-ignite the preposterous flames of the "food vs. fuel" argument. She writes, "we’re putting nearly 40% of the US corn crop in our gas tanks." Central in trying to make this an alarming statistic is the imagery that just as the corn is about to be distributed to millions of corn-on-the-cob deprived starving people around the world, greedy ethanol producers swoop in and buy up all the food to be turned into fuel. In reality, this is not how the system works. There is no question that more corn being grown in America today is being used for ethanol production than as compared to, say, 10 years ago. But the reason for this is that the corn is specifically grown to be used for ethanol. There is demand for the crop so farmers grow more. This means that farmers (American farmers) can grow something that is profitable. Moreover, it means that they can grow something without having to turn to public assistance. 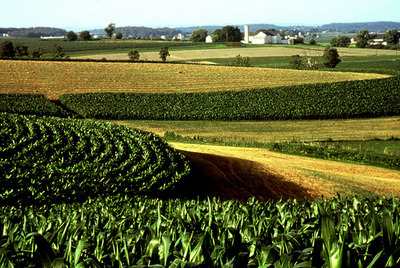 In 2000, U.S. corn production was 251,854 metric tons. In 2013, U.S. corn production was about 353,715 metric tons. Despite the increase in the amount of corn grown between the two years the actual amount of corn available for human consumption remained the same. Additionally, although most of the world outside of the western hemisphere does not eat corn the way that we do, world corn production reached record highs in 2014. So it's safe to say that there were fewer starving Africans being deprived of non-nutritious high-fructose corn syrup products. Considering the obesity problem that we have in America, even if we were depriving someone of corn chips perhaps we would be doing them a favor. Ms. Carlson tries to take another swipe at ethanol's impact on gasoline prices by writing that "since mid-December, ethanol prices have risen above reformulated gasoline prices because of the sharp drop in crude-oil and gas prices, along with a rise in corn prices. As of 26 January, Chicago Board of Trade ethanol futures were holding around $1.448 a gallon, whereas New York Mercantile Exchange reformulated gasoline futures prices were at $1.3167, giving the renewable fuel a 13-cent premium." There are two problems with this statement and its implication. She's assuming the current surprisingly low price of crude oil will remain surprisingly low, and she fails to calculate in all the other marketing and distribution costs associated with the retail price of gasoline. There are no public filling stations in America regularly offering gasoline at $1.31 to their retail customers. Moreover, in a check around my neighborhood, at those stations where E85 is available it is available at about 40 cents less than regular E10 and 50 or 60 cents less than premium E10. Therefore, with the above real at-the-pump prices in mind, her entire explanation of how the Renewable Fuel Standard may he causing higher ethanol prices is rendered immaterial, if not outright incorrect. Other comments made by Ms. Carlson such as the "2012 drought decimating corn supplies" are untrue or misinterpretations. Even with the drought conditions in 2012, American had a corn surplus that year. If ethanol producers are struggling to make a profit it's primarily because they are limited to how much ethanol they can sell, not because (or solely because) of oil's current low price. There is no reason whatsoever why the majority of passenger vehicles on the road today should not be using E15, E20, E30, E40, or any other blend that the individual owners would like to put in their vehicles. Not only would these increased blends be a boon for domestic ethanol producers and farmers, without having to raise the price of ethanol, it would keep billions and billions of dollars from leaving our country and going to support terrorist regimes and anti-American incidents. As always, I'm happy to hear any criticisms, objections or clarifications that someone deems necessary. I did write to Ms. Carlson directly and submitted this article to her for comment. I never received any reply from Ms. Carlson.